A collection of embarrassing old (some low-res screen grabs) and new photos from Jimmy’s unremarkable career. Before hiring LeBron James, Magic Johnson hired Jimmy to be his announcer on Magic's late night Fox talk show in 1998. Jimmy also got to perform in the occasional comedy skit. Mobile recording in Emeryville, CA next to SF Bay. Sadly, Jim forgot to set the parking brake and rolled into the bay. Jim & bride Sonya at Movieguide Awards in 2010. 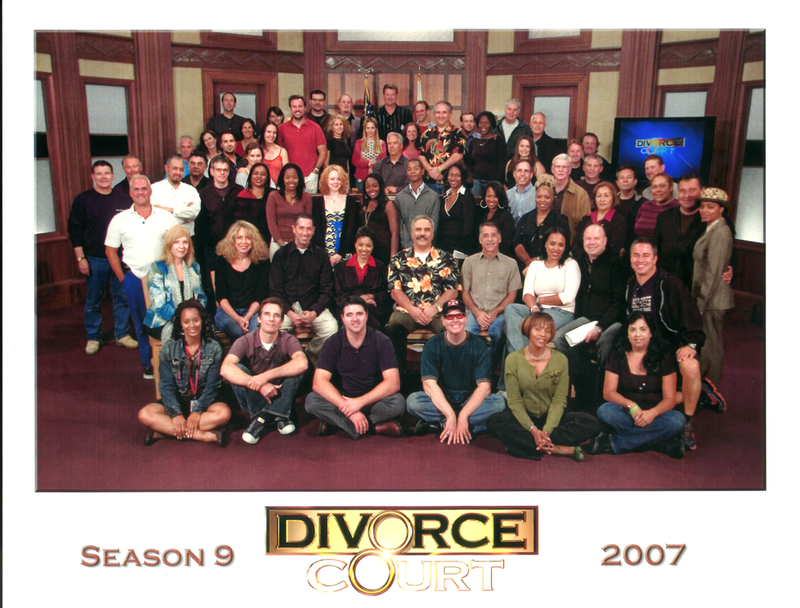 Jimmy (tall guy in center, back row) was the announcer on FOX's Divorce Court for 12 glorious seasons. Jim has had the honor of doing some 5 or 6 shows with Amy Grant, including this On the Road Special in Minneapolis for the Family Channel in 1991. Jimmy's home studio in 2009. Not Ed Grimley, but Harry Connick, Jr. in his first TV special on the Family Channel in 1991- the long-haired hippie freak is Jim. 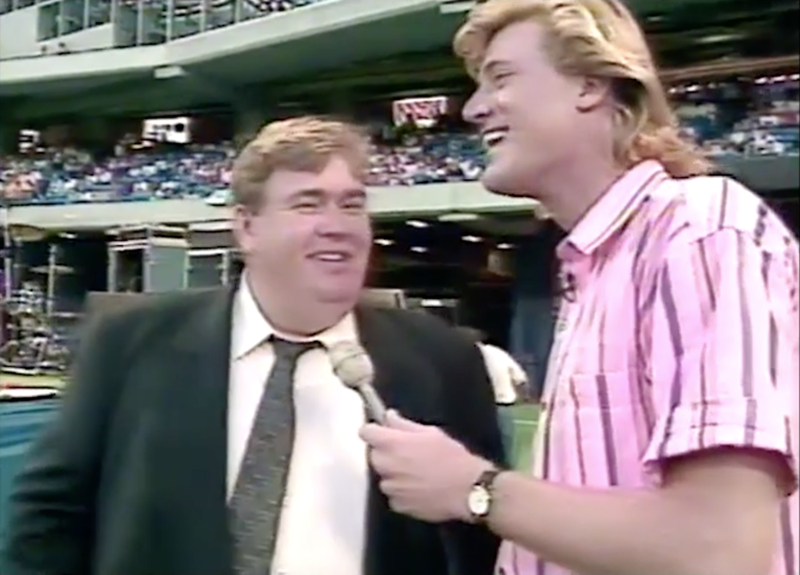 The late John Candy really was the nicest and funniest guy in the business. 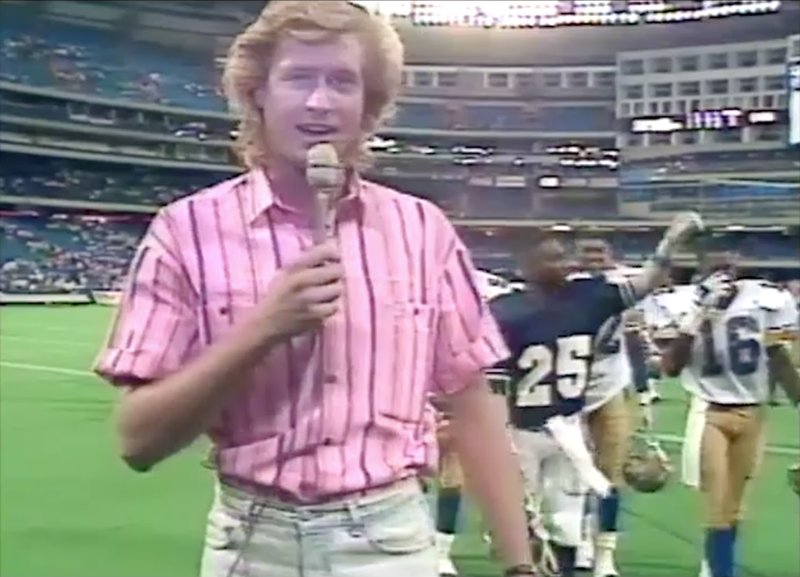 He owned the Toronto Argonauts along with Wayne Gretzky back in 1991. Hosting an episode of Videosycrasy on the Family Channel in 1991, on location in Vancouver. 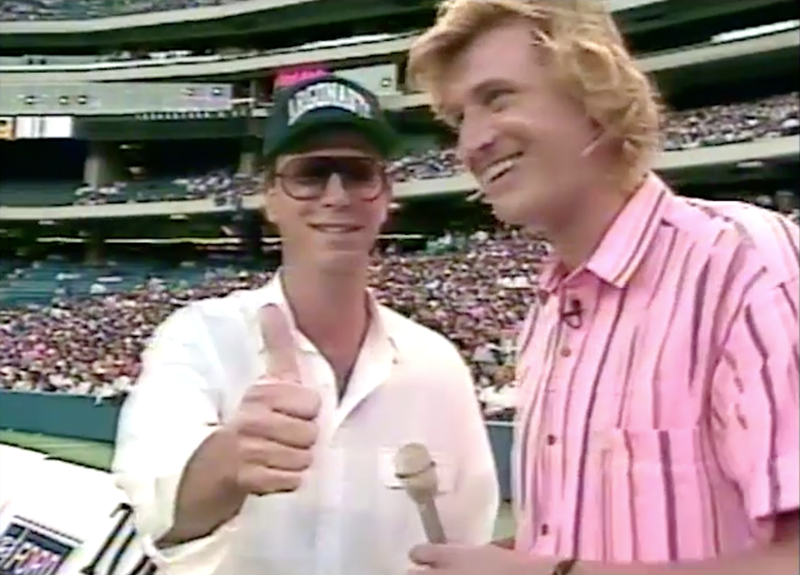 Michael Bolton and Jim did a Family Channel special in 1991 which included a charity softball game scene and a freakishly small microphone. Interviewing Michael Bolton in his tour bus outside the stadium in Vancouver, 1991. Jim towering over the late movie trailer king Don LaFontaine at the Key Art Awards, Hollywood. Amsterdam botanical gardens, 2018. Jim was subsequently attacked by bees and rendered delirious with thousands of stings. The Hodson Family in 2017: Jonathan, Sonya, Jim, Hayley. Fox Soccer Channel was Jimmy's home for 5 years as their signature voice. Gooooooooal! Shooting documentaries in Beijing, China with uber-producer Craig Forrest in front of a Chinese missile silo. Shooting documentaries in Manila, Philippines while sporting then-in-fashion hot pants and fanny pack. A large water main break in Zimbabwe, Africa. Actually, Victoria Falls, 1988. Jim with his family in Botswana, 1988. 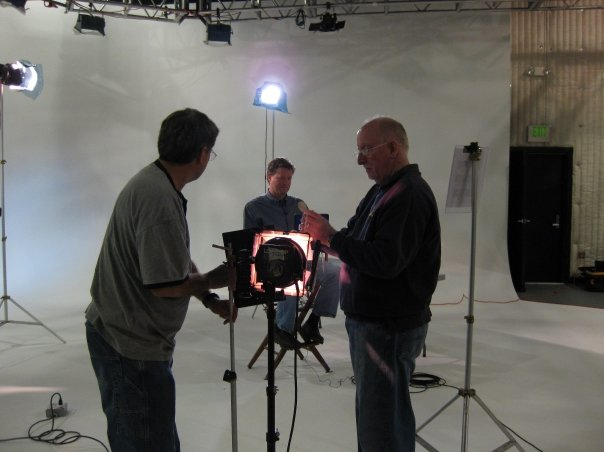 Jim worked in front of and behind the camera and microphone, directing music videos and commercials. Here Jim asked for directions to the Pyramids from a local Egyptian, 1989. Body fat and muscle mass were of no interest to Jim in the late 80's. Jerusalem's Dome of the Rock was. On vacation in Antwerp, Belgium, 2018- recording VO on the river cruise ship between museum trips. In the old days when actors had to actually drive to recording studios- here recording Divorce Court intros. 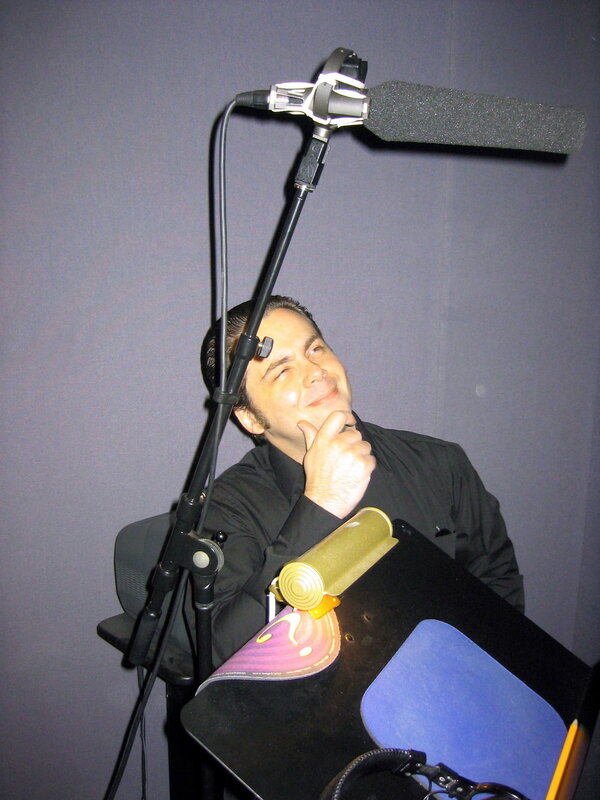 Early voiceover class. Top L-R: Scott Rummell, Jimmy, Dave Spiker. Front row: Jack Roth and legendary casting director Elaine Craig. Shooting Jim's first music video series Real Videos in 1985, on location here at the Space Needle, Seattle. Hovering over Waikiki in 1985 hosting Real Videos. He then dropped hundreds of fresh pineapples on unsuspecting sunbathers. Renowned photographer & friend Kevin Foley took Jimmy's headshots in 2008. Jim & bride Sonya who was TV executive on CBS's Touched by an Angel, producer at E! News Daily, and worked at CBS Sports and ABC Sports. Shooting the 2nd episode of Real Videos in 1984 in LA's Chinatown. The show went on to run for 25 more years. 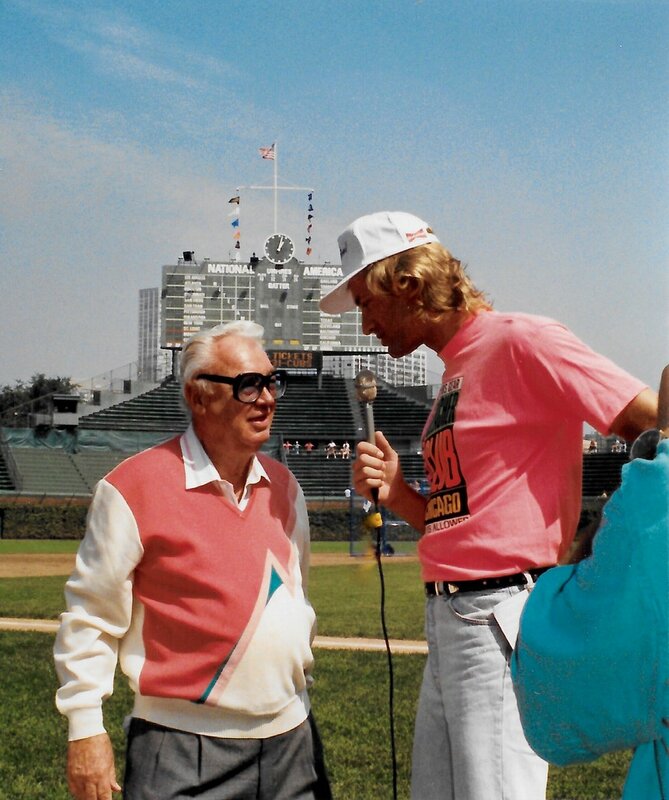 Asking legend Harry Caray to say "holy cow" over and over at Wrigley Field, Chicago, 1991. Beautiful Daughter Unit Hayley and Jim at LA Kings game, 2018. More Divorce Court announcing in Burbank. Hodson family moments before being swept away by a rogue wave in Crystal Cove, CA; Jonathan, Hayley, Sonya, Jim, 2017. 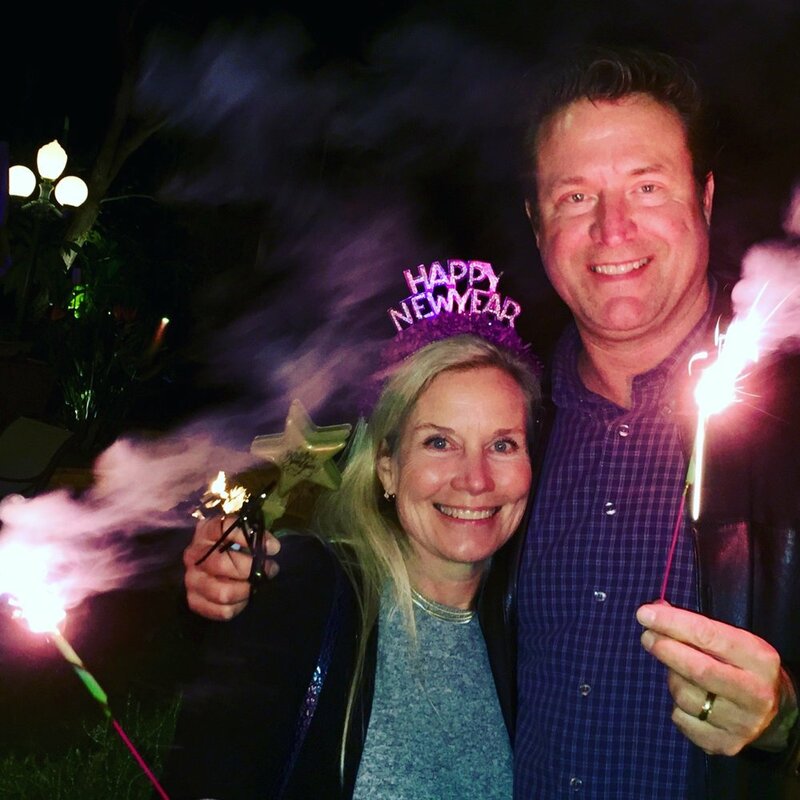 Beautiful Bride Sonya tries to incinerate husband Jim on New Year's Day 2018. Off to the SAG Awards despite once again not being nominated. Note the table number 81... which is several kilometers from the main stage. SAG Awards 2018, Shrine Auditorium. Didn't win a single award. 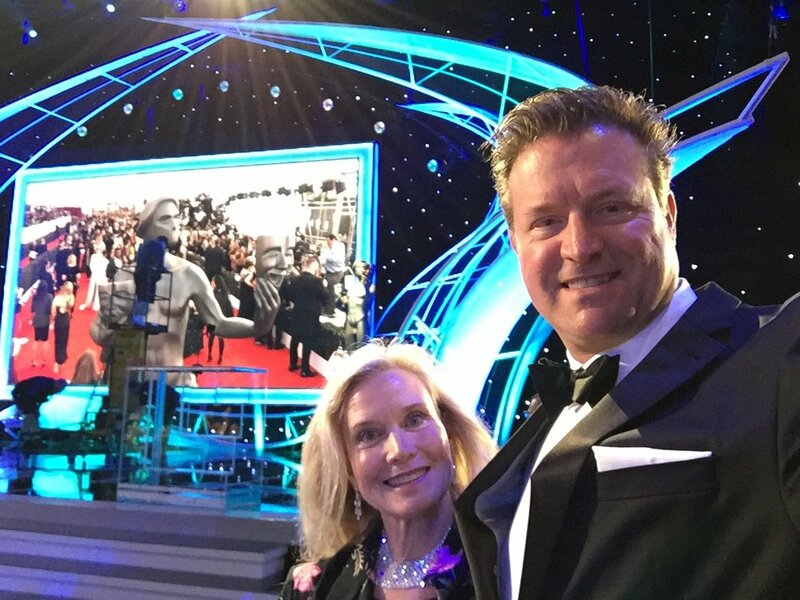 In front of the exposed-buttock statue-man at the SAG Awards 2018. Interior of SAG Awards. Jim tried to rush the stage to announce the show but was repelled by security guards. Not Jim's house, but Leeds Castle in the UK with late spring spreading of polystyrene flakes in 2018. 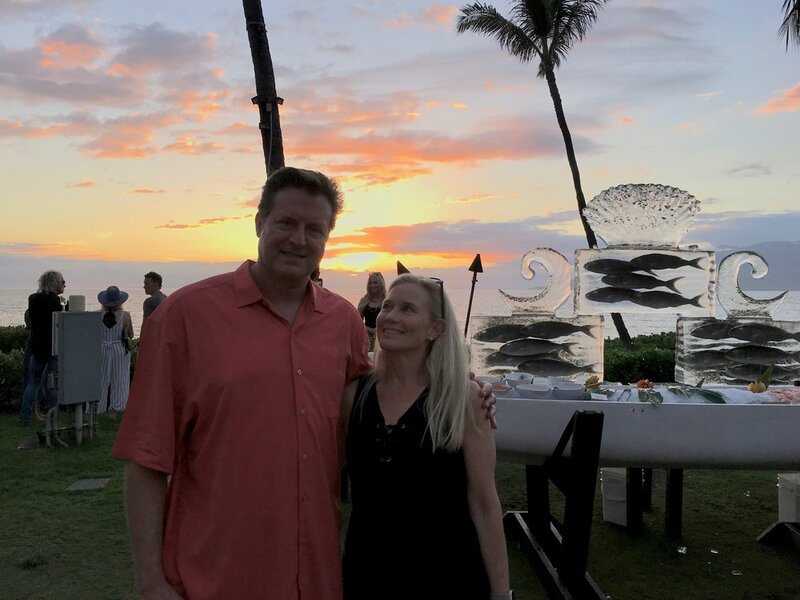 2018 Maui Film Festival. Later, Jim melted down the ice sculpture and freed the fish. 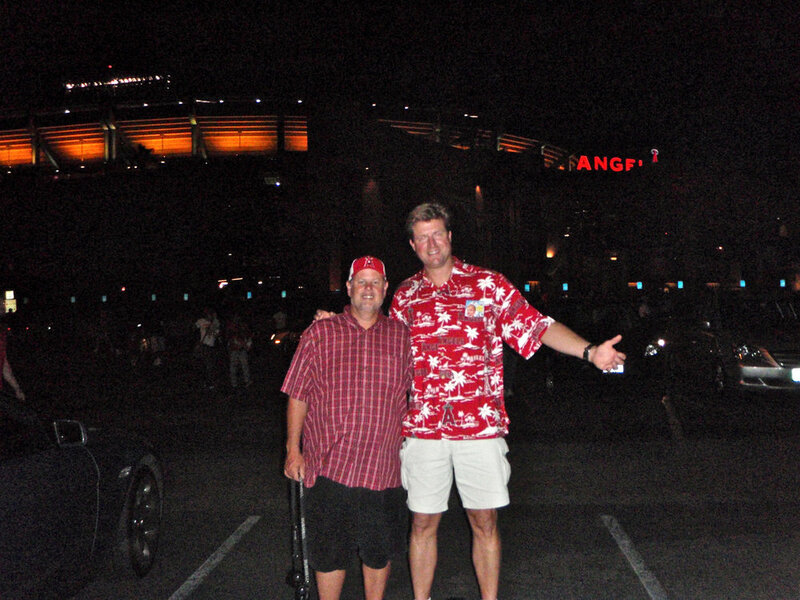 Height comparison between 6'-8"/203cm announcer Jim vs. normal-sized cameraman Paul at In-N-Out Burger event in Hawaii. Jim has been the voice of In-N-Out since 1989. 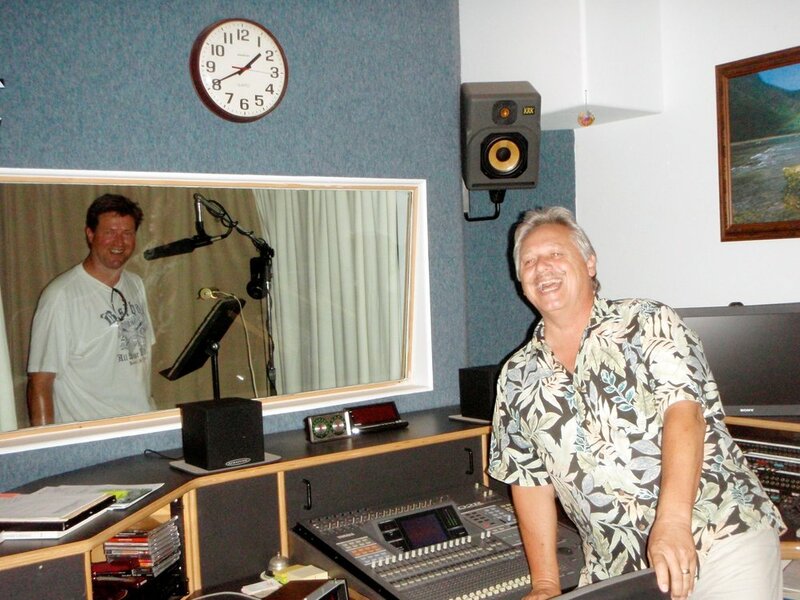 Recording voiceover in a hotel room in Maui- the beauty of mobile recording studios. Jim spent the entire vacation in this closet and even ordered room service in there. Top movie trailer voice Scott Rummell (left) and Jim met at this stadium in 1976 when they both sold peanuts in the crowd and have been fast friends and colleagues ever since. A makeshift hotel recording booth in Pula, Croatia 2015. The housekeeping maids were unamused. Performing in a commercial produced by Craig Forrest, 2012. 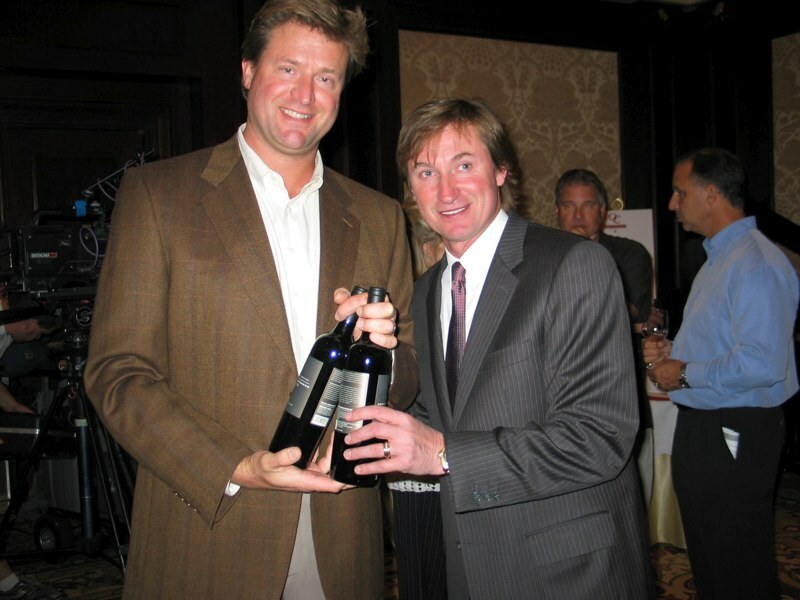 The Marginal One with the Great One Wayne Gretzky at his wine label debut in Westlake Village, CA. Real Videos episode in 1985 at Anaheim Stadium. Here Andre Thornton teaches Jim how to spit tobacco juice. 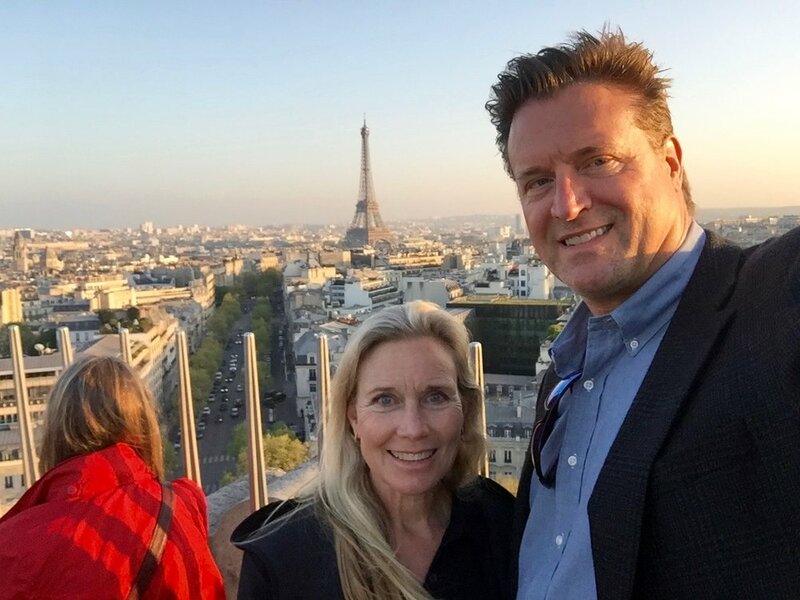 With bride on top of the Arc de Triomphe in Paris before consuming inordinate amounts of macarons and escargot, in that order. 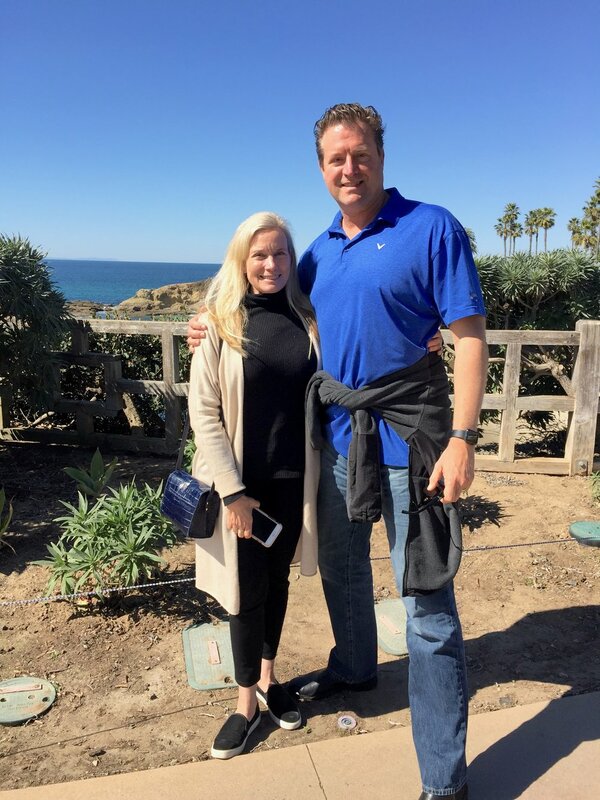 The Hodsons tried to helicopter from Kauai to Japan in 2017 before turning back after a few minutes due to limited fuel capacity. Sealed behind glass at the wonderful Audio Images recording studio with Davey Lou in Kauai. Below frame, both men are wearing grass skirts. 1986, lightning in a bottle. 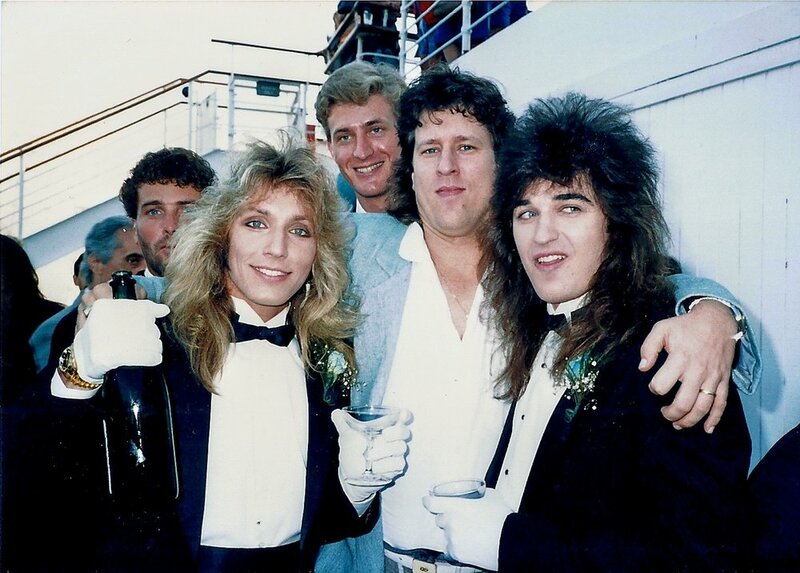 Recording artist Michael W. Smith, Robert Sweet of Stryper, Jimmy, agent John Huie, Michael Sweet of Stryper at Robert's wedding, Queen Mary, Long Beach, CA. Jim was the signature voice of Fox Soccer Channel for all 5 years of its existence. 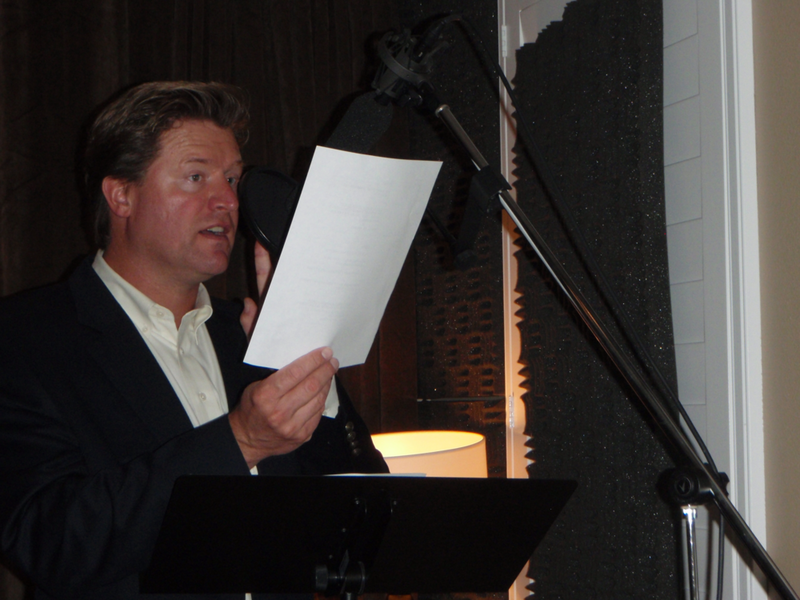 Here, sound designer Mario Manti-Gualtiero adjusts the microphone for Jim's freakish height. 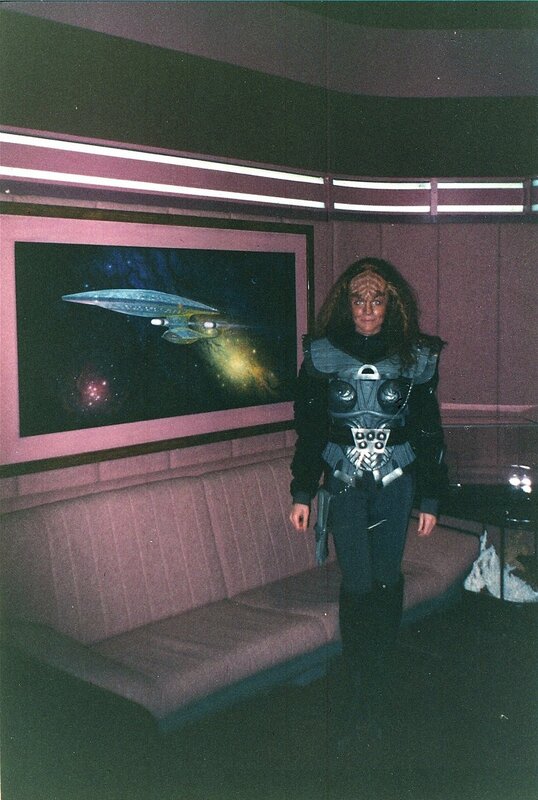 Jim's wife Sonya got to fulfill Jim's dream of performing as a Klingon on Star Trek TNG in 1993, while 6'-8" Jim did not. 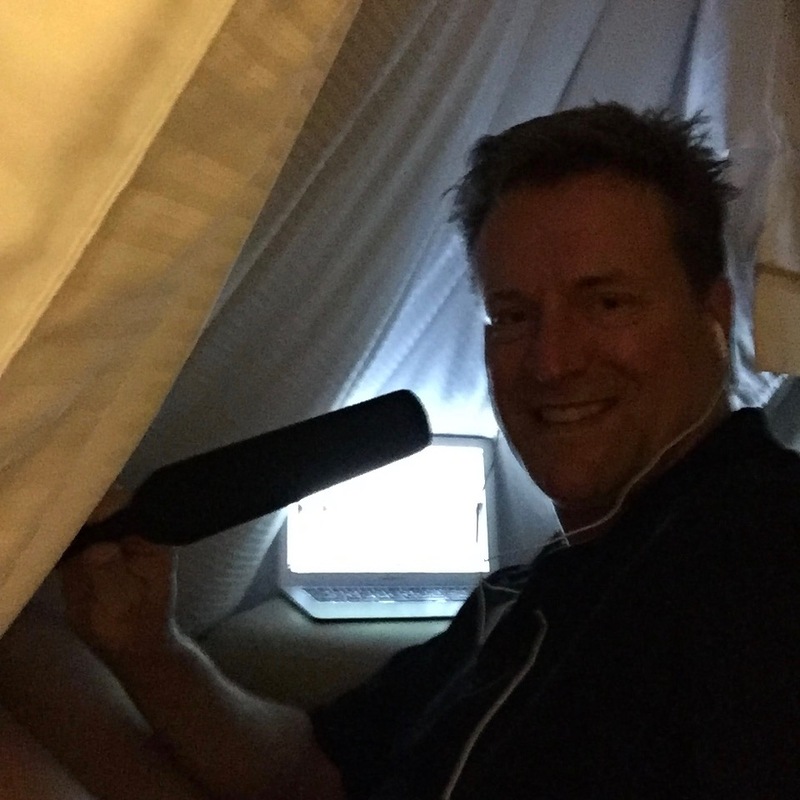 Voiceover recording on the road in a hotel in Plano, TX 2016. The mattress collapsed on Jim and he wasn't found until days later by hotel security. 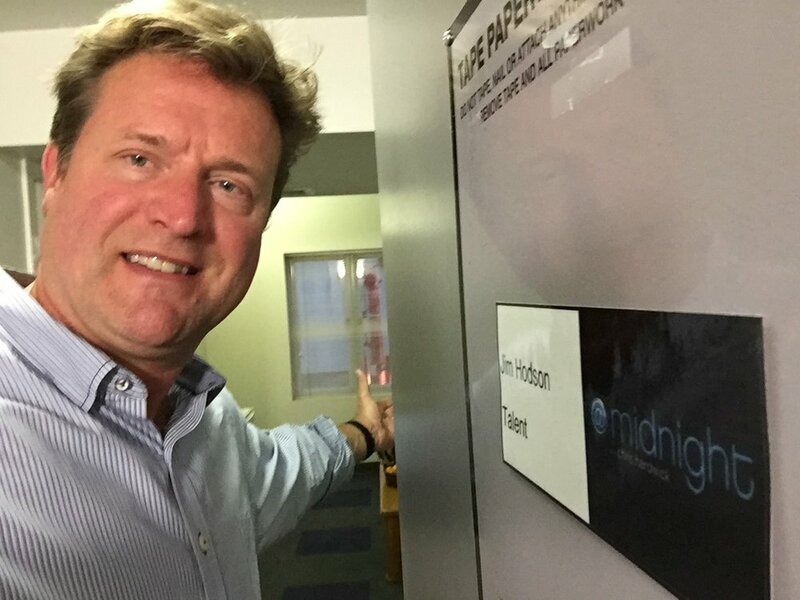 Comedy Central dressing room moments before getting "let go" for not performing a profanity-laced diatribe after assurances there would be none. As comedians would say, Jim does not "work blue." The late great Super Dave Osborne (Bob Einstein) offered to drop Jim from the Fuji Blimp during a game onto Cecil Fielder. Jim declined. 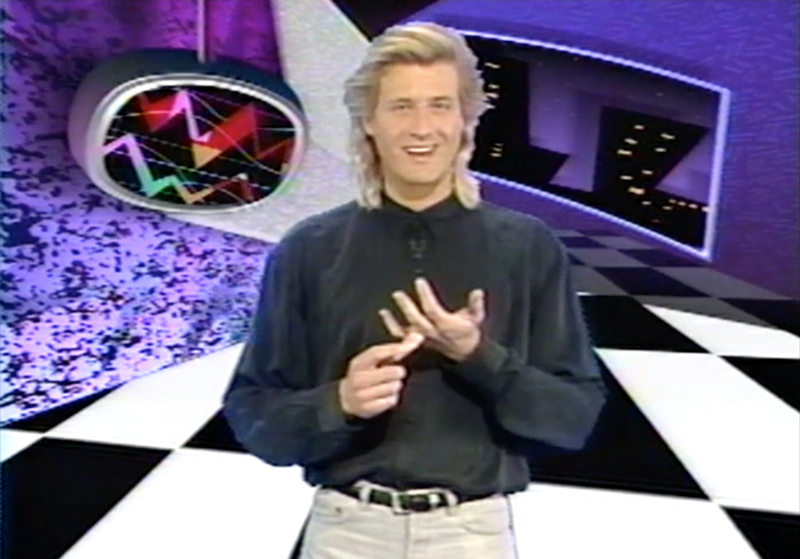 Hosting Videosyncrasy on the Family Channel in 1990. Jim, comedian Steve White, and Sheila E. in a Magic Hour skit on FOX. Sheila was the bandleader and Jim was the announcer, here being the mouthpiece for Steve's flirtations with Sheila, 1998. 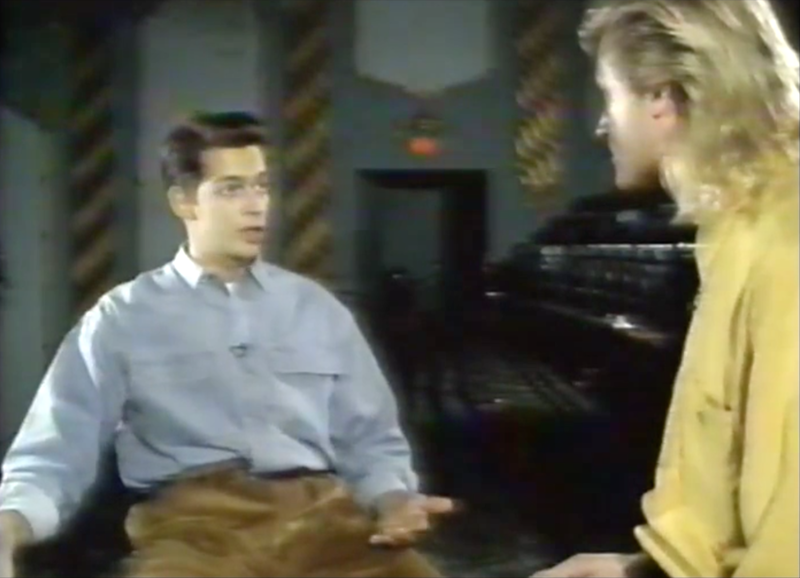 Kenny G actually flew his own private plane to this interview in Virginia on Videosyncrasy, 1990. As a segment host for Hockey Player Magazine on ESPN2. Here at Luc Robitaille's charity celebrity hockey game at the old Forum in Inglewood, CA. E! 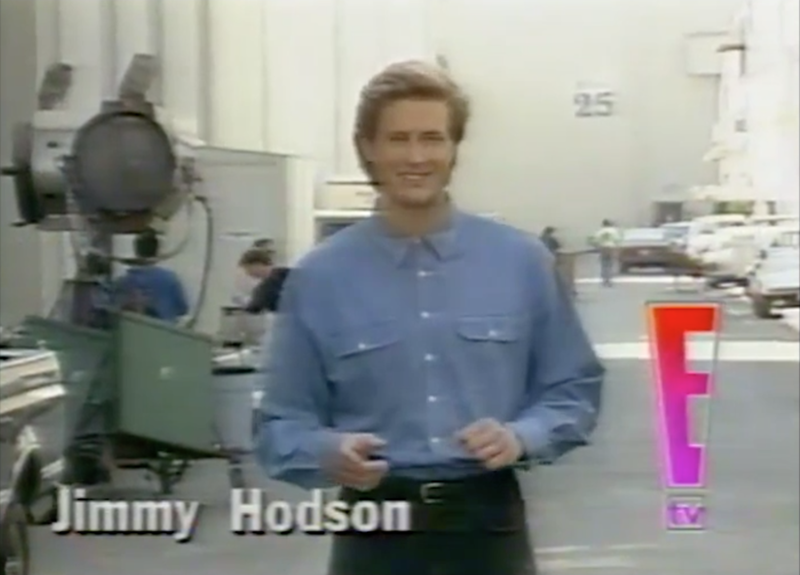 Entertainment Television produced a pilot for a half-hour syndicated show with Willow Bay as host and Jim as the backlot studio reporter in 1995. Post game wrap up on the field in Toronto. Raghib "Rocket" Ismail and the other players didn't notice Jim and knocked him down in their rush to the showers. Having a laugh with tennis great Vitas Gerulaitis who, sadly, passed away 3 years later from carbon-monoxide poisoning. 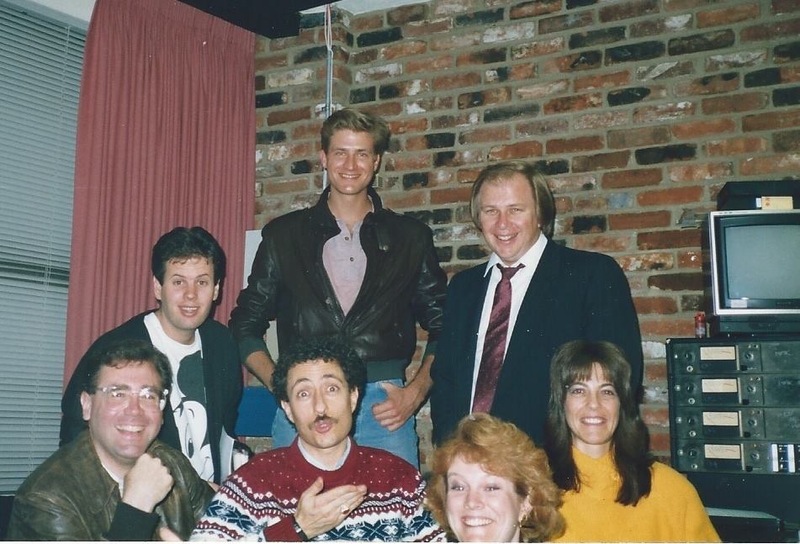 Jim's first of 4 meetings with Michael Bolton, this one in 1990 in Virginia Beach, VA. Bolton has a 4 octave vocal range. Jim's is 4 notes. Stuntman Mike Johnson taught Jim a number of stunts including this fire burn on a Videosyncrasy episode in 1991. The flames spread to engulf Jim's entire body, explaining his appearance today. Jim is not really quite this tall, just a special effect for Bartels & Jaymes, composited by Ken Slater who later became a very good friend & godfather to Jim & Sonya's chitlins. Interviewing Mick Hucknall of Simply Red in 1991 in LA. Skydiving, Jim had to dangle from the wing strut & then let go. The parachute deployed, but the radio broke & Jim had no idea where to land & ended up in a sewage treatment pond. Seconds before a crazed orca whale bit off much of Jim's head in 1991 at Niagara Falls Marineland. Jim has continued working unimpaired ever since. NYC Grammys, 1991. Hammer interrupts Jim's interview with Jill Goodacre and Harry Connick, Jr. Jim and Scott Rummell had once MC'd Hammer's concert when he was called "Holy Ghost Boy." Behind the scenes interview at Amy Grant's music video shoot in LA for her #2 hit "Every Heartbeat" in 1991. 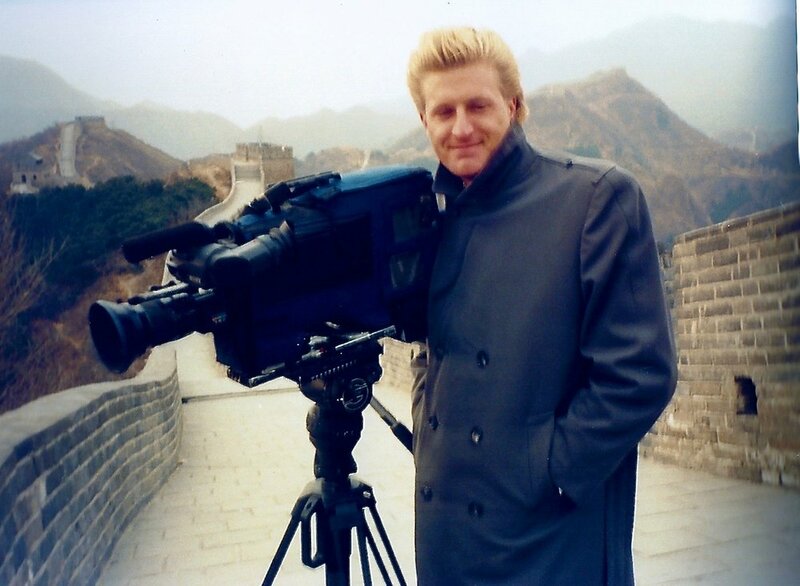 Shooting documentaries at China's Great Wall in 1989, which, apparently, was built to repel monsters according to a recent Matt Damon movie. 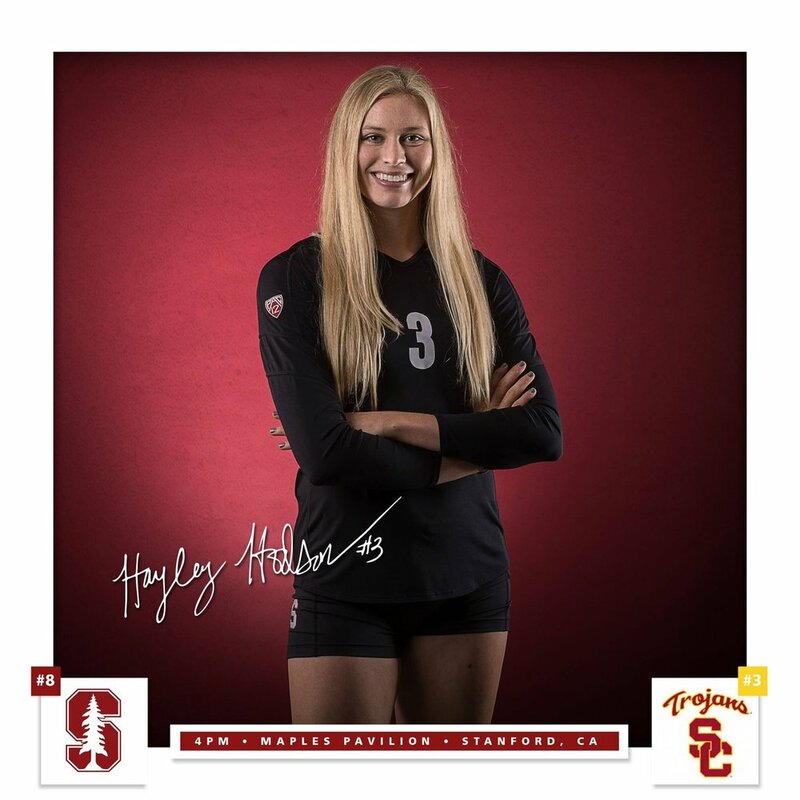 Daughter Hayley was the #1 volleyball recruit in the US and National Freshman of the Year in 2015. The legendary David Hasselhoff at the Long Beach Grand Prix in 1985. Jim has all his albums and a "Hoff" shrine in his home to this day. Being interviewed for the 25th anniversary of the pioneering Real Videos which Jim co-created back in 1984. Jim's late father-in-law on the right, Cotton Dunn, won the USGA National Juniors tournament in high school & went on to the PGA Tour like the man on the left, but with slightly less success. 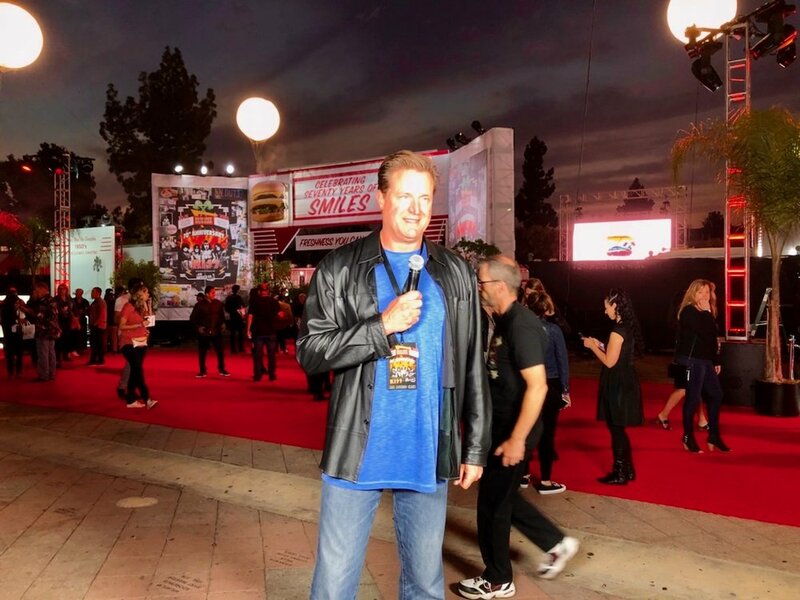 Hosting In-N-Out Burger’s 70th Anniversary Celebration & KISS Concert at The Shrine Auditorium, October 22nd 2018. Introducing KISS with In-N-Out's "Party Boys" at the INO 70th Anniversary at The Shrine Auditorium in LA. 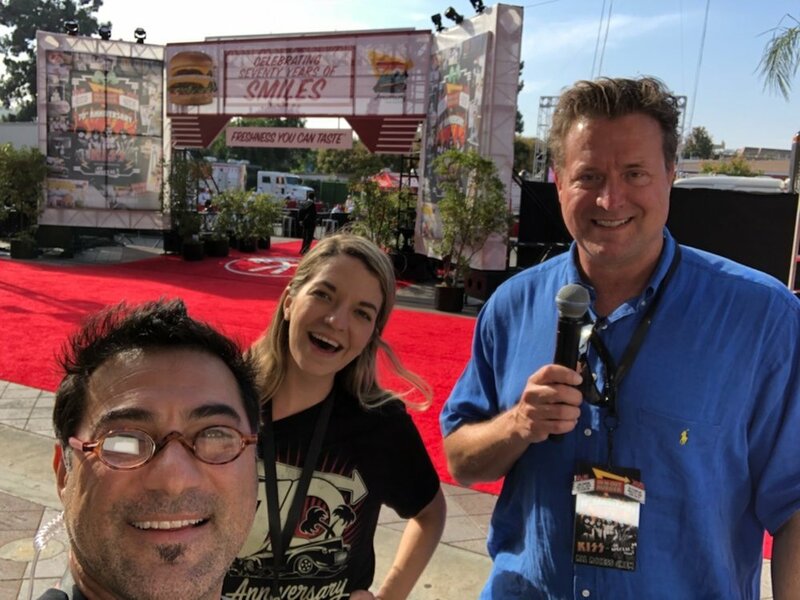 Rehearsing on the red carpet at The Shrine in LA with Nersi Elahi and Tami Hinson of In-N-Out's stellar TV crew. • Jimmy has worked with most of the cast of the original Star Wars movie: Harrison Ford (on the Magic Hour), Mark Hamill (on a Lucas Arts commercial for the video game Mercenaries), Carrie Fisher (on NightLight), Anthony Daniels & a Kenny-Baker-less R2D2 (at the debut of Disneyland’s Star Tours), but paradoxically, not with the legendary voice of Darth Vader, James Earl Jones, or with the very tall Peter Mayhew. • Jim used to be a VJ. He created and hosted 2 national shows in which he not only interviewed everyone in music, but jumped out of airplanes, went hang gliding, got set on fire, fed killer whales, inexplicably entered an alligator pit, fell off of Amy Grant’s horse into a mud puddle, slammed into the ivy in the outfield of Wrigley Field, dangled off a helicopter over Waikiki, jumped off a 45 foot waterfall, and drove a JetSki through stinging nettles in Chesapeake Bay, sending the chopped up nettles down his swimming trunks, inducing fiery agony and a very hurried trip to a 7-11 for calamine lotion. 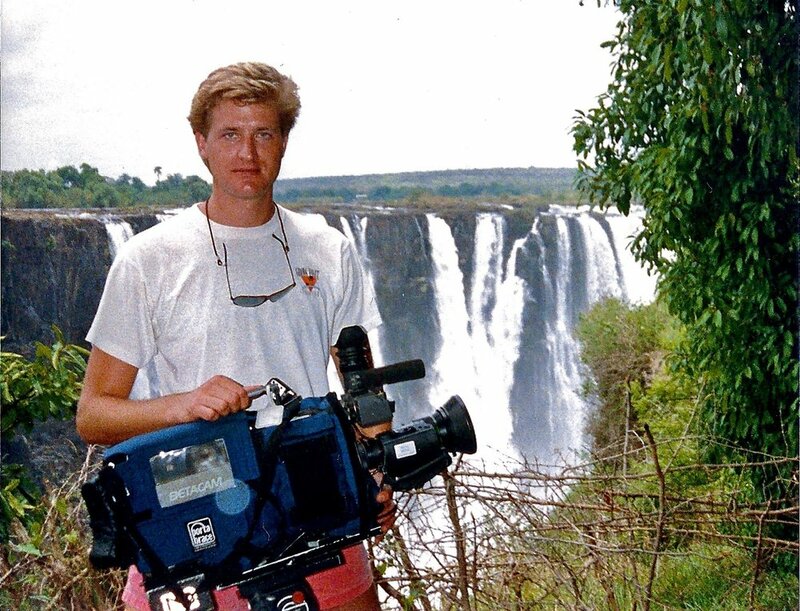 • Jim used to be a documentary cameraman/director as well, shooting in some 32 countries worldwide from China, India, Japan, Thailand & the Philippines to Europe, the Middle East and all over Southern Africa. He and Beantown Productions’ Dave Carr also toured Brazil with Guns & Roses, shooting a documentary of their Rock in Rio performance, during which Jim’s life was threatened twice as he happened to be holding a $40,000 BetaCam and was unwisely unarmed. He also travelled to Sao Paulo, Brazil with Slash to visit the Snake Institute there. • Jimmy jumped on the Wayne Gretzky/LA Kings bandwagon in 1988 and learned to play ice hockey as an adult and only recently retired. Seeing 6’-8” Jim in full pads and skates was a terrifying sight. •Jim owes a big portion of his career to Magic Johnson. When he tested to be the announcer on Magic’s ill-fated late night Fox talk show, Magic said “Oh, it would be good to have a tall announcer.” They never tested anyone else, Jim got the job and appeared in a few skits as well as announcing the show which ran for a whopping 3 months in 1998. • Be careful what you wish for... as a youngster, Jim always wanted to be the voice of the baseball TV disclaimer, i.e. “without the expressed, written consent of Major League Baseball...” Sure enough, Jim was the voice of that timeless, awe-inspiring disclaimer on all FOX MLB regular season, playoff and World Series games from 2004 to 2009. • Jim used to share an office across from the Capitol Records building in Hollywood with casting director extraordinaire Elaine Craig, VO actor Scott Rummell and Emmy-winning composer Tim Hosman. •Once, while tracking the Bushmen of the Kalahari in Botswana, Africa, their guide prepared them to meet some of the most “primitive people on earth.” He warned Jim and producer Craig Forrest that the Bushmen did not wear clothing and had never seen white people before. After many frightening hours in a Jeep they stumbled across a tribe and were met by a Bushman eating out of a severed steenbok antelope head with a spoon while wearing a T-shirt from the Broadway show “Cats!” Apparently not as “primitive” and isolated as they had been led to believe (although the T-shirt was rather ripped and holey). •Jimmy once held open a door and was actually touched in the abdomen by Princess Diana in Vail, Colorado. This was, of course, before she died. Had this occurred after she passed away, it would really be noteworthy. Ironically and recently, Jim discovered that England’s Queen Elizabeth, Diana’s ex-Mother-in-law is a 7th cousin from the same clan. •After judging on an Emmy panel with other actors, many of whom were classic, big name stars from old sitcoms, Jim rode the elevator down to the garage with Don Porter who played Sally Fields’ dad on her first TV series “Gidget”. Jim suddenly burst into song with the Gidget theme, “Wait ‘til you see my Gidget, you’ll want her for your valentine...” For some reason, Mr. Porter pressed a button and got off the elevator early. Why Jim would even know the Gidget theme is a cause for concern. 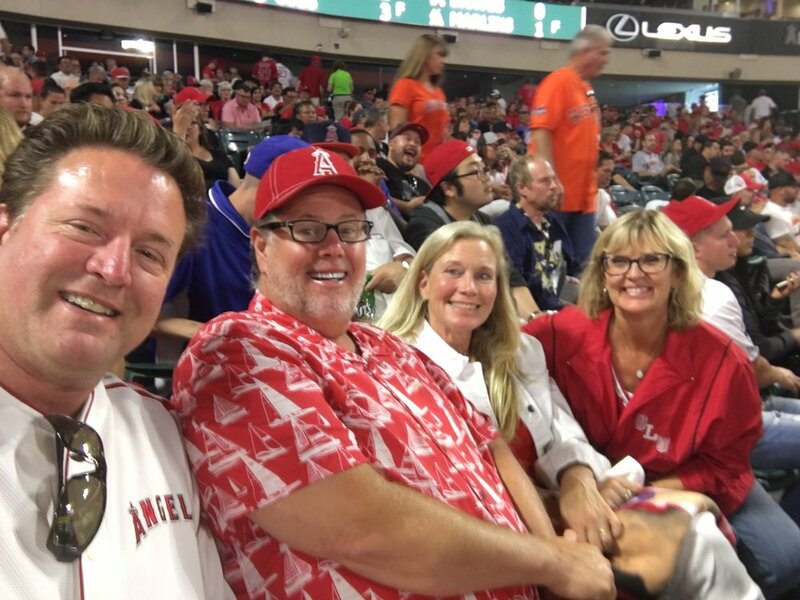 •Jim’s wife Sonya was an executive on the CBS hit show “Touched by an Angel.” Executive Producer Martha Williamson graciously wrote a role for Jim to play an NBA play by play announcer on the show. He flew to Utah for filming and performed his first take. Series regular (the late) John Dye who played the Angel of Death walked over and said, “ You’re not really gonna do it that way are you? I mean, it’s your career.” Jim fell for it hook, line and sinker for a few agonizing moments before realizing his leg was being pulled. • When Jim proposed to his then-girlfriend Sonya, she vomited. Well, okay, she had food poisoning already, but she did say “Yes!” Why Jim would propose to someone suffering from food poisoning at the time is a long story.